Time to end my titanosaur series on a high note - or more appropriately, a tall note. A very tall note. 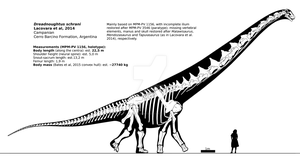 Like Puertasaurus, Argentinosaurus is often claimed to be THE largest dinosaur ever to exist. This probably isn't true considering that, with all the variables of fossilization, most species of dinosaur will never be discovered by humans, but there's been a meme going around since the early 2000s that every new giant sauropod discovered, or an obscure taxon that the person finds interesting (even things we now know to be under 25 tonnes), regardless of how fragmentary, will be hyped as ''larger than Argentinosaurus''. You can probably guess my opinion on that. Being recovered as the sister taxon to Patagotitan, most of the body was relatively easy to project; the hardest part, oddly enough, was figuring out how the preserved vertebrae fit together and where they would be placed on the skeleton (which was all Franoys's doing). Argentinosaurus would have lived alongside the potential elaphrosaurine Gualicho, the abelisauroids Skorpiovenator and Ilokelesia, rebbachisaurid sauropod Cathartesaura (not to be confused with the turkey vulture, Cathartes aura) and the enormous theropod Mapusaurus. Update 12/21/18: Same as Patagotitan and Puertasaurus, aesthetic changes, shoulder rework and new GDI. -Bonaparte J, Coria R (1993). "Un nuevo y gigantesco sauropodo titanosaurio de la Formacion Rio Limay (Albiano-Cenomaniano) de la Provincia del Neuquen, Argentina". Ameghiniana (in Spanish). 30 (3): 271–282. -Mazzetta, Gerardo V.; Christiansen, Per; Fariña, Richard A. (2004). 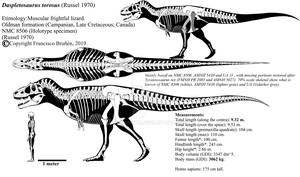 "Giants and Bizarres: Body Size of Some Southern South American Cretaceous Dinosaurs" (PDF). Historical Biology. 16 (2-4): 71–83. doi:10.1080/08912960410001715132. Retrieved 2008-01-08. -Hussam Zaher, Diego Pol, Alberto B. Carvalho, Paulo M. Nascimento, Claudio Riccomini, Peter Larson, Rubén Juarez-Valieri, Ricardo Pires-Domingues, Nelson Jorge da Silva Jr., Diógenes de Almeida Campos (2011). "A Complete Skull of an Early Cretaceous Sauropod and the Evolution of Advanced Titanosaurians". PLoS ONE. 6 (2): e16663. doi:10.1371/journal.pone.0016663. -Wilson, J. A., Pol, D., Carvalho, A. B. and Zaher, H. (2016), The skull of the titanosaur Tapuiasaurus macedoi (Dinosauria: Sauropoda), a basal titanosaur from the Lower Cretaceous of Brazil. Zoological Journal of the Linnean Society. -Carballido, J.L. ; Pol, D.; Otero, A.; Cerda, I.A. ; Salgado, L.; Garrido, A.C.; Ramezani, J.; Cúneo, N.R. ; Krause, J.M. (2017). "A new giant titanosaur sheds light on body mass evolution among sauropod dinosaurs". Proceedings of the Royal Society B: Biological Sciences. 284 (1860): 20171219. doi:10.1098/rspb.2017.1219. How would Alamosaurus stack up against this guy? I don't think it's quite as big, GDIs based on Scott Hartman's skeletal and the Perot mount put the largest specimens around the 50 t area, slightly smaller than the convex-hull Patagotitan. How big do you think "Antarctosaurus" giganteus would be? I'm under the impression that it might be roughly as big as Patagotitan itself. If they are closely related yeah, ''A. 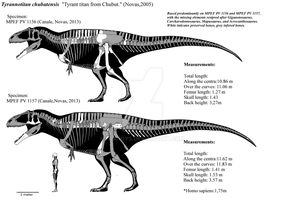 ''giganteus could be the same size as Patagotitan. Then again, I remember hearing the circumference of the femora wasn't quite as big as Patagotitan's, so it may have been smaller but longer-legged. Yeah, I read the same thing. That even though the femora are long, they are somewhat gracile. Maybe it was a bit smaller and less robust than Patagotitan, assuming they were related. What was your reason for these three updates? So.... Argentinosaurus is to sauropods what T Rex is for theropods ? Lots of challengers for "The Biggest" Title but manages to edge them all out. It has, at least, achieved the 'standard to be measured by' position. Yes, and like with the theropods it's a meme to name anything big as a contender. I was wondering if I could trace this for my page , I'll try to give credit because I'm new. Wait, did you just not-downsize a dinosaur? Edit: My bad, didn’t see the previous version. You could say it's a not-downsize compared to the first attempt at rescaling the tail; it ended up barely over 30m and like 4 tonnes lighter from tail loss alone. 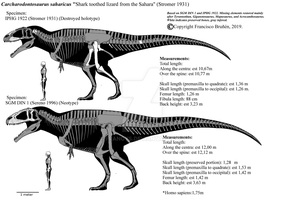 Anyway, about sauropod size. You mentioned under your Gigantism in WWD post that you thought 70t for Brachiosaurus was reasonable? so Argentinosaurus-sized, basically? What specimen do you refer to by that? The 70t size was based on a scaling I had done on the ilium of the Potter Creek specimen (briefly shown in one of the SVPOW authors' powerpoint presentations), which I thought was 20-25% longer than the holotype's; but I later found that the ilium of the B.altithorax holotype was not measured in the description, and that other measurements for the Potter Creek material are very close to the holotype in size (213 cm heavily reconstructed humerus against 203 cm, 274 cm rib against 273 cm largest rib). So that ended up completely discrediting my WWD estimate; the same Brachiosaurus specimen is the one in my Brachiosauridae chart today, at almost half the mass I first thought it was. 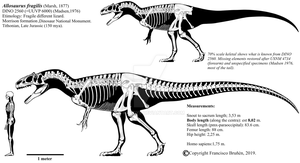 Out of curiosity, where did you get the B. altithorax mass estimates you used in your brachiosaur chart from? You placed the B. altithorax holotype at ~32.6 tonnes, while Franoys has it at ~37 tonnes and my GDI yielded ~40-41 tonnes with an SG of 0.85. I've also checked the discord GDI channels for anything, nothing there too. I'm guessing Fran didn't have the time to update his chart yet; we estimated it together applying the volume discrepancy in Wedel's GDIs to the +21% convex hull of HMN SII. I see, although nowadays I'll advise against it in your case. I admit I'm guilty of using the simplistic "Berlin Giraffatitan model * 123%" method for estimating Brachiosaurus' mass in the past, but after I did my volumetric estimation I'm not so sure anymore. 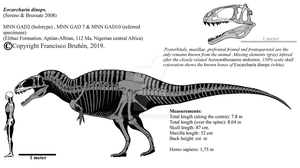 The reason is that Wedel's discrepancy is for the models he used for his volumetric estimates, which are his own Brachiosaurus skeletal and Greg Paul's 1988 Giraffatitan. 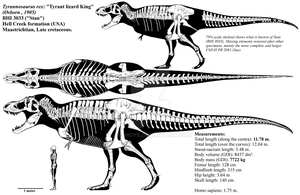 Different models, such as the Giraffatitan convex hull model and Scott Hartman's skeletals, would give different results. You're using Scott Hartman's reconstructions in your chart so I'd recommend using volumetric estimates based on those same models for consistency rather than mix-and-matching stats from different models. I would also go into how the mounted Berlin Giraffatitan along with Greg Paul's and Scott Hartman's skeletal reconstructions of Giraffatitan are a bit problematic, but that's a story for another day. Indeed, if the discrepancy was Wedel's creation alone it wouldn't be a good idea to follow it. Luckily, it's corroborated by the functional length of all overlapping dorsals in Brachiosaurus and Giraffatitan. That makes it the least speculative discrepancy out of all methods tried, as the GDIs were done on different authors's reconstructions and afaik, we lack a nonspeculative cross-section of either animal. Knowing the width of the dorsal centra would also be helpful, however, so if that's available it'd be a good idea for me to edit the mass based on it. The Benson et al. (2014) mass estimate for the Brachiosaurus altithorax holotype is about ~56 tonnes, which is probably excessive. Mind sharing that SVPOW post? What model did they use? My GDI uses Scott Hartman's model, if you've seen my GDI sharing journals. The SVPOW authors did a GDI that got 35860 L of volume; given sauropod density, if they said a mass of 34-35 tons those should be short or US tons rather than metric. But yes, the results are close. Yes! My guess was correct about the new length! I remember you also expected it to be 73 t back before the v1 was released to match Mazetta et al; well, there you go. I was okay with the previous weight too though. I'm glad about whatever weight estimate that's not far from Mazetta et al and Planet Dinosaur. At first I was going to, but given the amount of bones preserved... I'd have to do some annoying edits to the vertebra lineart to even slightly differentiate it from Patagotitan, because everywhere else they'd be identical. Can I use this as a reference please? Sure, but be warned I'm now thinking the tail on this is too long, perhaps by more than 22%. Take that back!!! Jk. The single decker buses where I live are 3.2m tall for reference. Iâ€™m not sure how tall the double decker would be. Correction, double deckers are expected to be under 4.95m in height, otherwise there needs to be safety precautions. What happend to the scale bar bus?! Nice update. The bus was attacked by a Mapusaurus and fled. The femur is now 269cm? What sorcery is this? It was never really 255cm, see the description. 269 is one of the possible isometry scalings. Don't worry I was joking. Makes more sense for the back to be flatter like this. I also like the osteoderms it now has. And it's just neck, don't worry. However, I disagree with what you say about 'dwarfing the French Monster': (at least) 3 specimens of it have been found, and the most complete and most mentioned one is in fact the smallest of the 3. Is the French Monster the biggest dinosaur ever? Search for 'fibula' in the comments. The largest fibula (calf bone) is estimated at between 1.8 and 2.1 m, which would correspond to a femur of between 2.7 and 3.2 m.